Sandmeyer Steel Company stocks Alloy 330 nickel alloy plate in thicknesses from 3/16" (4.8mm) through 1" (25.4mm) for applications in the thermal, chemical and petrochemical, and ore processing markets as well as for the power generation industry. Alloy 330 (UNS N08330) is comparable to and competes directly with RA330®. Alloy 330 (UNS N08330) is an austenitic nickel-iron-chromium alloy developed to provide excellent resistance to carburizing and oxidizing atmospheres at elevated temperatures. With a nickel content of 34 to 37 percent, the alloy remains highly resistant to both chloride stress corrosion cracking and embrittlement from the precipitation of sigma phase. It is readily fabricated using standard procedures for stainless steel and nickel alloys. The alloy is used extensively in elevated temperatures where resistance to the combined effects of thermal cycling and carburization is required. Alloy 330 (UNS N08330) is an austenitic nickel-iron-chromium alloy developed to provide excellent resistance to carburizing and oxidizing atmospheres at elevated temperatures. With a nickel content of 34 to 37 percent, the alloy remains highly resistant to both chloride stress corrosion cracking and embrittlement from the precipitation of sigma phase. The high nickel and chromium content provides excellent resistance to both oxidation and carburization. The oxidation resistance is also enhanced by the silicon content of the alloy. The alloy performs well under cyclic conditions of heating and cooling and in alternate carburizing and oxidizing atmospheres. Alloy 330 offers a high level of corrosion resistance, particularly to oxidation, carburization, and nitridation. It is readily fabricated using standard procedures for stainless steels and nickel alloys. The alloy is used extensively in elevated temperature atmospheres where resistance to the combined effects of thermal cycling and carburization is required. Alloy 330 provides a high level of corrosion resistance, particularly to oxidation, carburization, and nitridation. In aqueous environments the chromium content of 330 provides resistance to oxidizing conditions, while the nickel content enhances resistance to reducing conditions. The alloy’s high nickel content also makes it highly resistant to chloride stress corrosion cracking and sigma phase embrittlement. Alloy 330 has good oxidation resistance and resists scale formation up to about 2000°F (1095°C). Any scale which is formed is tightly adherent, particularly under cyclic conditions of heating and cooling. The alloy's 35 percent nickel content and silicon addition contribute greatly to its excellent resistance to carburization. In alternating carburizing and oxidizing atmospheres, Alloy 330 exhibits excellent resistance to the “green rot” phenomenon. Alloy 330 exhibits good resistance to nitrogen-containing atmospheres where the oxygen content is low. It is used extensively in components handling cracked ammonia. Alloy 330 is an austenitic alloy that cannot be hardened by thermal treatment. Only cold working will contribute to increased room temperature strength. For most high temperature applications, 330 is not annealed after cold forming or welding. 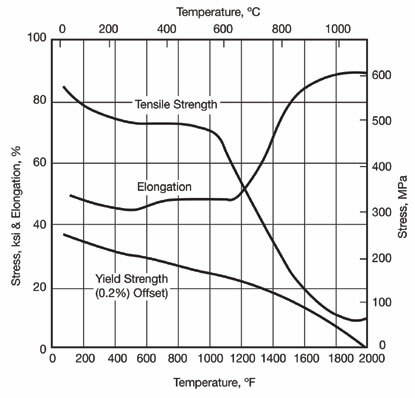 If a full anneal is required, it should be carried out in a temperature range of 1870-2050°F (1020-1120°C). Water quenching provides the optimum creep resistance, but rapid air cooling to below 800°F (425°C) may also be utilized. Alloy 330 is readily hot or cold formed using the standard procedures for austenitic stainless steels and nickel alloys. 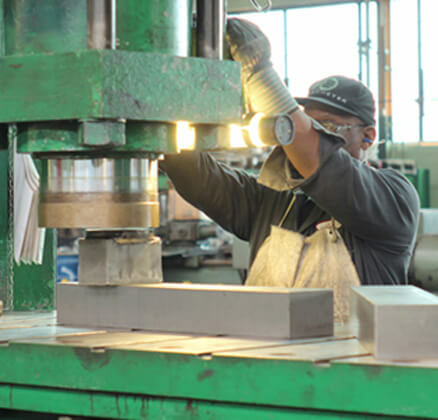 The work hardening rate of the alloy is comparable to austenitic stainless steels. Forming at room temperature is suggested. 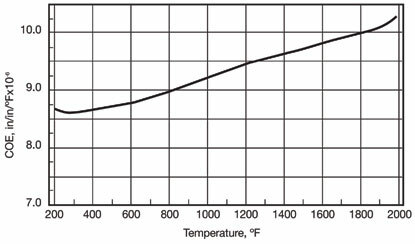 If hot working is required, the alloy should be heated uniformly to a starting temperature of 2050-2150°F (1120-1180°C) and finished above 1750¼F (950°C). Cooling should be by water quenching or as fast as possible. Annealing is recommended after hot working to ensure maximum corrosion resistance and optimum grain structure. Forming or bending should not take place in the low ductility range of 1200-1600°F (650-870°C). This can cause intergranular tearing in austenitic alloys. Alloy 330 can be welded by GTAW, SMAW, and plasma arc processes. For optimum corrosion resistance GTAW is preferred. Prior to welding, the material should be in the annealed condition, clean and free from scale, grease, and other contaminants. A zone approximately 1 inch wide on each side of the joint should be ground to bright metal. The interpass temperature should not exceed 300°F (150°C). Neither pre- nor post-weld heat treatment is required. Alloy 330 can be readily welded to a variety of dissimilar metals.